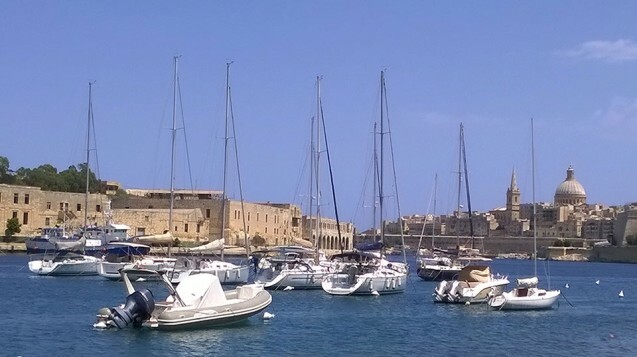 I’ve just got back from a lovely week in sun-dried Malta to return to a rain-drenched Britain and despite the quite obvious contrasts in our climates, my first impression of the country was actually the noticeable similarities rather than the differences. Malta gained independence from the UK in 1964 but the British influence is still evident everywhere right down to the three pin plugs and the cars driving on the left. 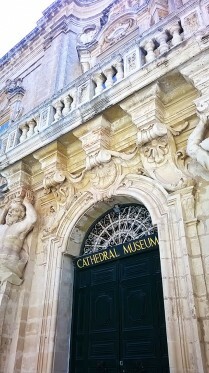 The Maltese language is a curious mixture of both Italian and Arabic influences, and it is the only historically Semitic language spoken in Europe so though it uses a Latin alphabet it includes modified letters. 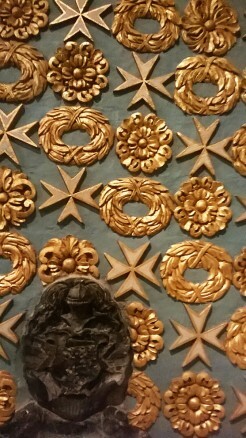 However everyone that we spoke to could speak perfect English, being as it is the other official language of Malta. At only 120 square miles, the island is pretty tiny so we spent our week traversing back and forth on the Arriva-style buses, taking in the country. 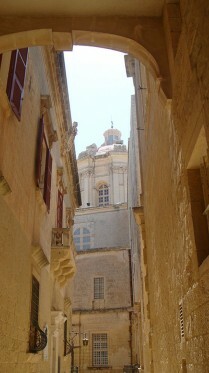 We took refuge from the sun in the shady maze-like streets of Mdina, the ancient walled city which was the old capital of the country. 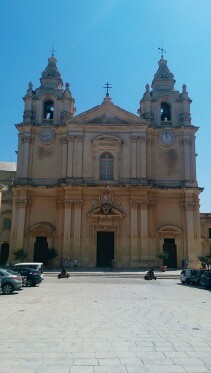 This is where St Paul the Apostle was said to have lived after being shipwrecked on the island, and its history stretches back 4000 years. 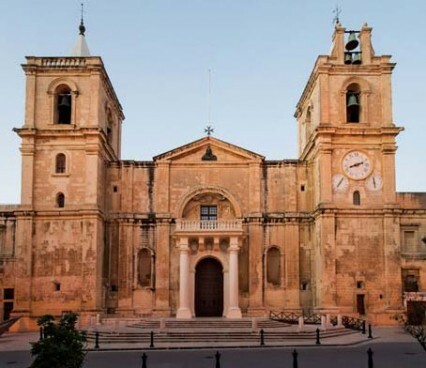 Nowadays Mdina is home to just 300 inhabitants, and though you can find numerous private palaces, museums and a magnificent Cathedral within the medieval grid of narrow sandstone streets, one overwhelmingly feels the truth in its colloquial name – ‘The Silent City’. 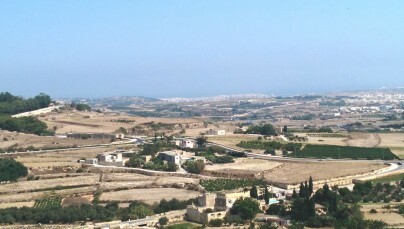 It felt like the highest point in Malta and, sipping cappuccinos on a museum cafe terrace, we were afforded an amazing view right across the flat landscape towards the northeastern coast. 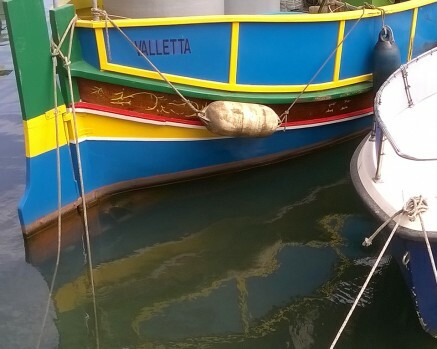 We stayed in a gorgeous apartment in Spinola Bay, a picturesque harbour on the lively St Julian’s coastline. We looked out from our balcony each day to sight of the fishing boats bobbing in the early morning waters and the committed joggers getting in their exercise along the seafront before the sun got too hot. 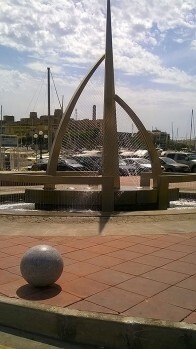 Curving round and out towards the laidback restaurant terraces and the lavish art hotel on the other side of Spinola Bay, the inlet reached its apogee at a busy roundabout marked by a contemporary sculpture. 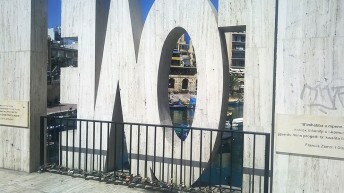 Richard England’s creamy white stone sculpture spells out the word LOVE twice over, but it has apparently antagonised locals that its letters are upside down. 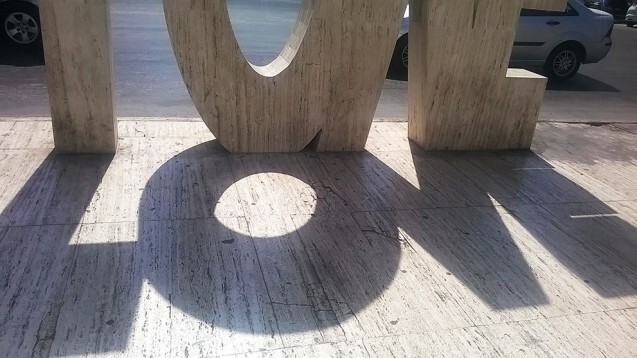 On our first day’s exploratory walks in the area, we passed the love sculpture at 3pm when its intention was entirely obvious as there was a perfect shadow cast upon the pavement. But every time I returned to take another photograph, the sun was too high or too low to recreate the word against the ground. Perhaps it was the suggestion of the fleeting nature of love which was what had prompted local criticism? 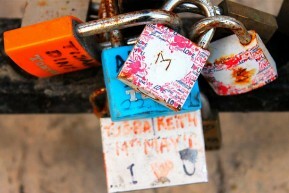 As if to counteract this interpretation the more romantic pairs of passers-by have started to mimic the Parisian habit of the Pont de l’Archevêché by attaching love-locks bearing their initials and tossing the key into the blue waters of the Mediterranean to declare their eternal love. We tried to follow this amorous tradition but, in typical Brit-style, logistics came before romance and the acquisition of a spare padlock seemed too much of a challenge! 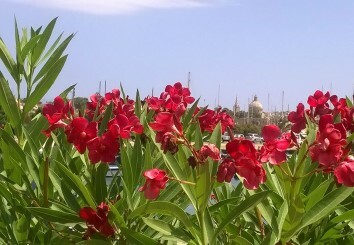 On our penultimate day we visited Valletta, the capital city which I had glimpsed many times from across the bay. 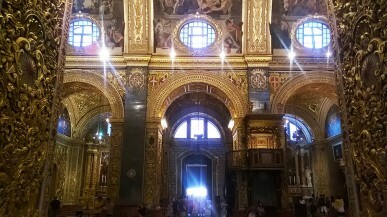 The St John Co-Cathedral in the center of the city looked austere from outside, but rather took our breath away once inside. 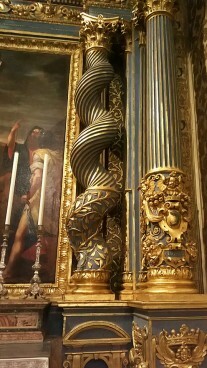 Every single surface was decorated in the most extravagant Baroque pattern and imagery, apparently added many years after the building of the church in the late 16th century. 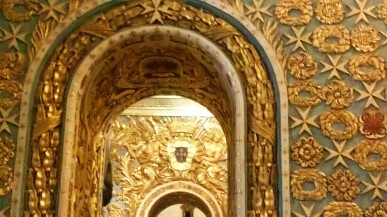 The lustrous gold surfaces on every decorative motif seemed to reflect the heat of the day which entered with the sweaty waves of tourists. 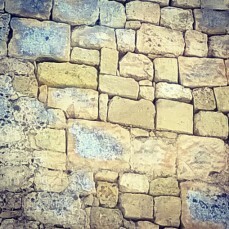 Fans had been set up in the space but to little effect, and with the clutter of people and the clatter of cameras and audio guides, it was a relief to climb the stone steps up to a cooler inner room. 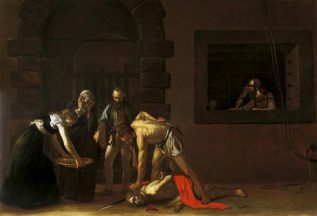 I turned a corner and there, facing each other from either end of this sanctum, were two world-famous Caravaggio paintings: The Beheading of St John the Baptist and St Jerome Writing. 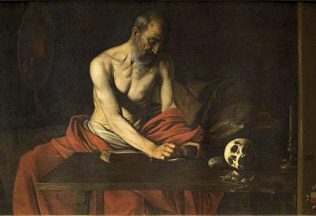 Many years ago I did my degree in history of art at the Courtauld Institute, and I probably should have known about Caravaggio’s history in Malta but these extraordinary paintings came as a complete surprise. We sat quietly and enjoyed the chiaroscuro effects as we underwent our own form of chiaruscuro with our hot flushed faces cooling to a more normal skin tone colour in the dark of the church.